The product is a simple design based on sound engineering principles. The Floodguards rely on the principle of the arch-dam whereby a convex dam wall is offered to resist the weight of the water and this then helps transmit the forces toward the riverbank (rock) rather than breaking through the dam wall. In Floodguards, the force is transmitted to the edges (masonry) where the neoprene strip is compressed against the back-frame and the seal enhanced. The product has only two components which are the guard itself and the permanent back-frame which together ensure a good seal can be achieved within seconds. The range of Floodguards was developed together over the past ten years to provide a complete system of protection against water ingress through the primary routes. The flood guards should offer a useable life of around 15-25 years where used at a typical frequency and in accordance with the user guide. . The only component which may require replacing (5-10 years) is the neoprene seal which can easily be replaced by the user or by Floodguards as part of a maintenance contract. With a flood imminent, people can enter a state of panic and it is essential that deployment is made as simple as possible. 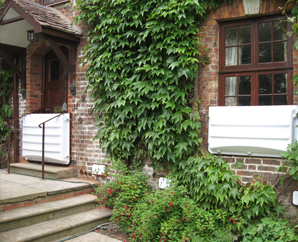 In the case of Floodguards, the hard work is done by our team of professional installers who fit the unobtrusive back-frame flush and watertight to the surrounding brickwork. 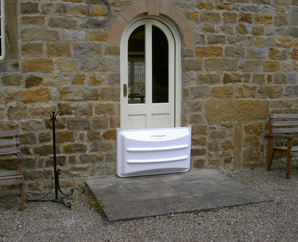 A complete Floodguards protection system can be put in place in a matter of minutes and once the danger is passed, it can be disassembled just as easily and neatly stored away, ready for the next time. Back frames can be ordered in grey, brown, brick red and white but we can also produce almost any custom colour to ensure that your frames blend in to the walls of the property being protected.